"I am very pleased with the products and also very impressed..."
"They were professional and fun"
"Every person I dealt with in the company was a professional..."
Our customer in Etobicoke, Ontario, had an issue with the previously-built rear addition before they owned the home. Water had started seeping in through the walls and concrete floor which was damaging materials used to finish their basement and affecting personal items. They were concerned that mould might begin to grow behind the finished walls. One Etobicoke, ON homeowner, was concerned with their unprotected current sump system. In the event of pump failure, power loss, or clogged and frozen discharge pipes their home would become flooded. This concerned the homeowner, as a result, could be a considerable amount of damages resulting in costly repairs and replacement. The IceGuard® Discharge Line protects the discharge line in the event of frozen or clogged pipes. If the pipes become clogged or frozen, some slots face away from the home that allows water to flow out freely. Our customer in Etobicoke, Ontario, was not protected in the event of pump failure, power loss, or clogged and frozen discharge pipes. With no backup system, their home could become flooded and damaged resulting in costly repairs and replacement. The UltraSump® System is designed to run 12,000 gallons of pumping, should the primary pump fail, or the home loses power. I had water coming on the basement floor one side during the snow melting time few weeks ago. Interested in having a door installed to my basement and perhaps some waterproofing/sump intallation. Inside seepage from window well after heavy downpour.water had risen to level of window frame. Another window on same side of house drained very slowly but did not seep inside. Can you come take a look at our basement tomorrow or Friday? Looking to have it waterproofed please. Ali-Fereid was the serviceman and he did an great job. Every person I dealt with in the company was a professional that treated me like a valued client. There was no hard sell about any of their services. The literature they supplied was very educational. This was one of the best customer experiences I have ever had. We are forever grateful for having chosen your company to take care of our basement leaking. We have never looked back, worth every single cent and my husband and I continue to sing your praises whenever the opportunity arises. Absolutely 200% satisfied and happy. Dean Eyford was very helpful and very professional. I was extremely pleased from the start to the end of the project. The office staff friendly and helpful keeping in touch and easy to reach. The crew consisting of Fitz, Storm, and Adam, were knowledgeable, professional, friendly and customer oriented which is a real treat now a days. My only peeve is that the crew had to attend to 2 or 3 jobs at the same time. I would recommend that the scheduling of work orders be done a little better. All in all it was a good experience and I will recommend the company to my friends and family any time. I am very pleased with the products and also very impressed with the company. Good job, Clarke! We would like to know why there is a difference between the membrane we were shown by Michael Beighton (salesperson) and the membrane that was installed. Also, what is the difference between the two. Lucio (foreman) did provide us with an explanation, but we would like clarification from Head Office. We were under the impression that our Sump Pump would have a battery back up, but it does not have that feature. there was an an inaccurate drawing from a previous visit and while we know the system is in and the salesperson/crewman confirmed it I'm not sure how clear the company records are on this point so should there be a future issue am concerned ther might be a question about it -NB especially if the house is sold in the future and the new owner has trouble. I am confident I'll never, ever have to call you again. Here at Clarke Basement Systems, we believe in the value of customer service and are proud to serve your area. We use only high quality products, installed by our excellent team of certified technicians so that you can be sure of long-lasting results. We want to work with you to find the solution that will work best for you! Problems with foundations often stem from broken soil or soil that has been weakened to the point where it can no longer support the weight of the structure. When this occurs, the best thing to do to remedy the problem is to install foundation piers and jack posts which will fix uneven, sloped floors. Additionally, wall anchors and I-Beam wall braces can correct walls that are leaning or bowing inwardly. For sidewalks, floors, and patios with uneven concrete, trust the PolyLevel Concrete Lifting System to give you a long lasting solution. Our PolyLevel system gets injected under the concrete, raising the concrete slab to the appropriate height and eliminating it as a safety hazard. Call us today to get a quick, cost-effective solution for your concrete lifting and leveling needs! 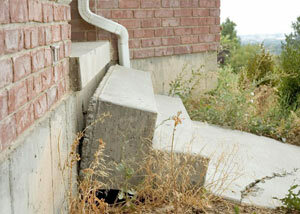 Problems with basements often stem from leaky pipes, sump pump failure, or flooding during heavy rain. If you find that your basement has a musty smell, pooling water, or mold and mildew, then you need to call in the experts at Clarke Basement Systems. We can repair water damaged walls and floor with matting and vapor barriers to seal out humidity and bugs while keeping the area energy-efficient. 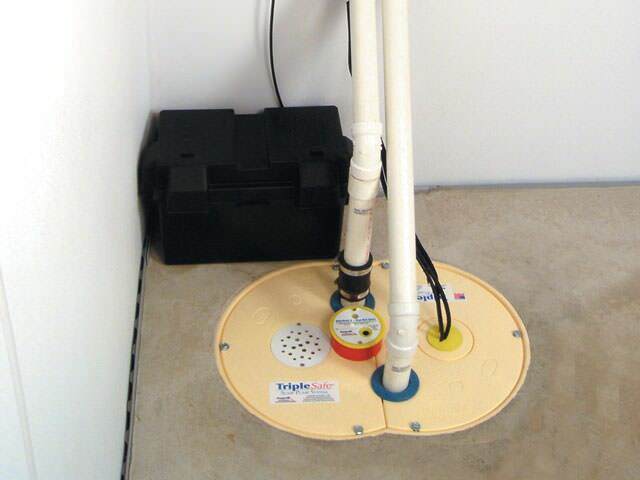 To eliminate standing water in your basement or crawl space, the TripleSafe sump pump is the proven product that will get the job done. With a primary pump, secondary pump, as well as a third, battery operated backup pump, you can always have peace of mind knowing that your home is protected from water damage. In addition, our excellent drainage systems will deposit any water in your basement a safe distance away from the foundations of your house, keeping your home safe. In many homes, the crawl space is the area of the home that is the most neglected. When a crawl space falls into disrepair, it can have detrimental effects on other areas of the home, such as the foundations. Don't let your crawl space become a health hazard and have it inspected by the professionals at Clarke Basement Systems. We can install vapor barriers, thermal insulation, and dehumidifiers to turn your musty, dirty crawl space into a clean, dry, energy-efficient area. If you've found mold on in your crawl space, it is either surface mould or wood rot. With surface mould, it can be scraped off, but wood rot can destroy wood support completely. We have patented products like jack posts that will provide a solution for support beams that can no longer hold up weight. At Clarke Basement Systems, we are proud to serve our area and we put customer service as our top priority. Trust our team of knowledgeable staff and certified, trained technicians to provide a solution for all your basement, foundation, and crawl space repair needs. Call us today for a free estimate! New concrete and WaterGuard installed. Starting demolition for new concrete and WaterGuard. Our customer in Etobicoke, Ontario, had a problem with their existing sump pump system because it had no backup in case of pump failure or power loss. Also, the discharge line was not protected against freezing temperatures or getting clogged. Their house was at risk of flooding if they didn’t resolve the problem. If the basement flooded, their belongings and home could become damaged resulting in costly repairs and replacement. The customer finally had peace of mind since their home is permanently waterproofed and protected for many years to come with our 25-year transferrable warranty! Our customer in Etobicoke, Ontario, had an issue with their basement. Water had been seeping in through the walls and up through the concrete floor. This was a problem because their finished basement and personal valuables were becoming damaged. The thermalDry® Wall Membrane system creates an efficient moisture and vapor barrier, helping to decrease basement humidity. It also stops water and any condensation from entering into your basement and directs it into your perimeter drainage system. Our customer was happy with their new waterproofed basement. They can now use the space and store their personal items without the worry of water damage. A home in Etobicoke, Ontario, had ground water leaking into the basement in a few areas. The flooring and baseboards were getting damaged and moldy. Water was damaging the finished basement, and personal items. The customer called Clarke Basement Systems and spoke to our inspector, Claude Mathieu who explained the solution to the problem. Dave Jackson and the team installed WaterGuard, ThermalDry Wall membrane and a TripleSafe sump system. The ThermalDry Wall membrane captures any ground water that may leak through the foundation walls, directing it to the WaterGuard. The WaterGuard also captures groundwater from footings, walls, floor joints, as well as from the under floor slab and takes the water to the TripleSafe sump pump to discharge outside through IceGuard. The IceGuard protects against frozen lines in the winter. The customer is happy knowing that the basement is dry and healthy and the system comes with a Lifetime, transferable warranty. Basement step retaining wall needs repair. Looking to have the parging done for our foundation around the house. Would like a quote. Thanks. Dampness in basement. Mildew smell. I have a few concrete slabs that have sunk around my property that I would like raised and leveled. Please contact me to arrange an appointment to inspect. Looking for competitive quote on external waterproofing. Approx 58 linear feet. Need professional opinion on membrane/dimple/both and sump/existing. I am available Tuesday May 15 after 11am; getting multiple quotes and opinions. Etobicoke near six points, Dundas and Kipling. I have water coming into my basement and running roughly 20 ft under the flooring. Need a quote to lift and repair the sinking concrete slab in front of my poarch. Please let me know if you come to do the quote in person or by photo? Thanks in advance.